Demolition has begun on the former ABC building in Toowong. The site is set for a $420 proposed residential development, Grace on Coronation. Demolition could take several weeks. 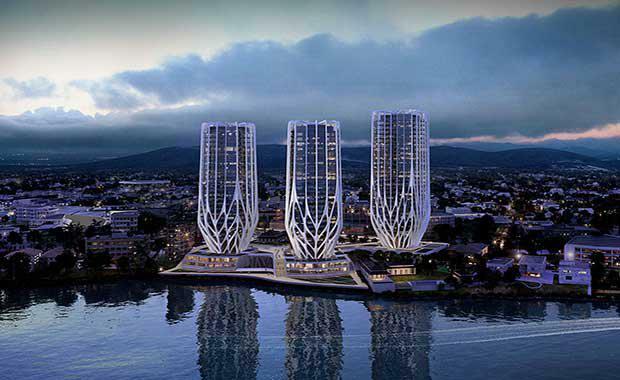 According to the Brisbane Times, Sunland's Iraqi-British architect Zaharias Hadid has proposed 486 units in three residential towers of between 22 storeys and 25 storeys, in an area which is zoned for a maximum of 15 storeys. The Grace on Coronation development has 566 resident car parks and an additional 69 visitor and temporary car parks on basement level one. Sunland. The proposal has yet to be approved by the Brisbane City Council. Council's neighbourhood planning committee chair Amanda Cooper told Fairfax Media in September that Sunland was entitled to request developments over the maximum ceiling heights. Cr Cooper said the council would make its decision after looking at the specific details in the application. "We assess every development on its merits," Cr Cooper told Fairfax media. "If we think we can do something different as to why it should be a good outcome, it becomes impact assessable. "That would allow local residents and businesses to have their say on the proposal. Credit: ABC[/caption]The former ABC building was abandoned in 2006 after fears of a cancer cluster arose. 18 women who worked at the studios contracted breast cancer over the previous decade. told Fairfax Media, the company had no concerns about cancer issues. "Already adjoining the site there's many residential developments," Mr Abedian said. "If there was such concern the same outcomes would be prevalent in the adjoining localities and it's not," he said. "Extensive testing has been carried out that has proved once and for all, emphatically, that there is no direct association with what has taken place and the site itself. "The 1.5 hectare site was purchased in 2013 by Sunland for $20 million.